The Last Guardian Review- nature of the beast. From the encyclopedic and antiquated illustrations of various mystical beasts during the opening credits, it’s clear that The Last Guardian exists in a world of its own. During the 11 years since the release of Team ICO’s masterpiece Shadow Of the Colossus, Fumito Udea’s vision has been realized, tinkered with, refined and altered as only an artist and perfectionist can- but around 2010, issues started to become apparent when the balance and compromise of artistry and business were at odds with each other. Trademark renewals, a lengthy exile and a triumphant, if curious reintroduction might deserve the burden of ‘development hell’, but The Last Guardian is more than that. For all the financial and commercial pressure, Udea was spearheading the next (and possibly final) chapter to two of the industry’s most revered games. E3 2015 reintroduced the game that had previously gone off the radar for the best part of 5 years- jubilant relief was overshadowed by doubt and apprehension. Just what happened between Sony and Team ICO in terms of negotiation and technical hurdles and a console transition will likely be one of the great mysteries of game development history. Shown again at TGS the same year, complete with a ‘life size’ projection of feral protagonist Trico that reacted in real time to its audience, The Last Guardians existence became a victim of its reputation. While I can (and feel obliged to) admit that ICO and shadow of the Colossus have issues, in my opinion, they are masterpieces and a pair of the strongest advocates that video games can be taken seriously as an aesthetic art form. Only Thatgamecompany’s (so far) trilogy of titles on the PS3- 2006’s flow, flower in 2009 and most recently Journey come close to the genuine, joyous and serene escapism that Ueda has achieved, and while TGCs games may not adopt or embrace traditional video game vernacular as much as team ICO, narrative and industry tropes are handled with care and artistically crafted. Of course, the griffin like creature Trico is a magnificent creation. A feat of design worthy of being the successor to sixteen colossi. Curious or playful, paralysed by fear or filled with rage, one half of the duo at the centre of The last Guardians story is a sight to behold. From a technical standpoint, both the detail of every feather blowing in the wind, to its sleek, agile body juxtaposed against its size and temper constantly amaze and instantly connect. Minute details and mannerisms noticed purely through observation (which you should discover yourself and avoid a guide) both drive the gameplay and build a connection. Fittingly, although some would say a design flaw, Trico is a bit temperamental. I never noticed it during the more tense or urgent set pieces (of with there are plenty) but every so often, my ability to solve a puzzle or move forward through an area was reliant on awkward AI rather than player skill. As the game progresses, so does your interaction and understanding of Trico. Feeding it with treats encourage, while simple commands such as praise or jump, develop the relationship and allow more lateral thinking on a large scale for the environmental puzzles. Improving your ability to use both the boy and Trico independently and as a team is the emotional and mechanical heart of The Last Guardian. Somewhat inevitably, the other characters play a supporting role but nevertheless, the unnamed and tattooed boy has a charm and innocence in keeping with any studio Ghibli creation- his flailing arms and exaggerated movements especially are reminiscent of Chihiro from Spirited Away. The two form a bond escaping the ruins and battling the enemies of the game personified by heavily armoured, bright eyed guards that play a similar role to the shadow beasts in the developers namesake, ICO. Get taken to a door before you struggle free and it’s game over. While trying to escape is far from subtle from a gameplay angle, and to the untrained eye, can seem a little tedious, I experienced some incredibly tense and desperate moments when the boy, the guards and Trico were all in the mix. In addition, most of your 10-12 hours will be traversing the simply stunning architecture, pulling hefty switches or (without spoiling some of the most incredible sequences) guiding and aiding Trico past more treacherous obstacles. The orchestral soundtrack is brooding, triumphant and reflective, while the booming sound effects of Trico’s impact on stone as well as water makes the audio experience just as memorable as the visuals. The narration, dotted throughout the adventure provides not only a little background, but also provides useful hints. It’s a pleasant addition and is the logical progression from Shadows periodic exposition. This might be a minor gripe to some, but what I found distracting and less in keeping with Udea’s ‘subtraction’ style was the constant use of a dualshock diagram explaining the controls. Optional or not (I explored the menus to turn it off- no luck) it feels like it was initially implemented for demonstration purposes and somehow stayed, detracting from the organic nature of the rest of the game. The game has no maps or signage, just intuition, observation and sometimes patience. 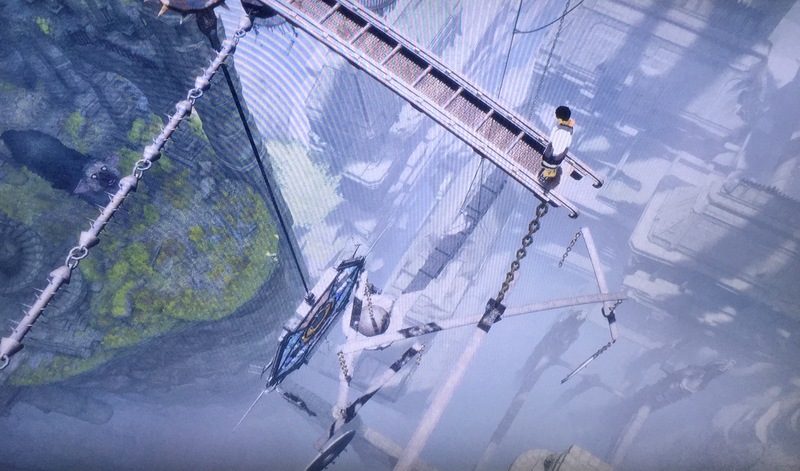 While I have become besotted with Trico and became invested in the emotional journey the pair embark on, I am constantly in awe as to how the scenery and architecture dwarfs anything in ICO or any other game I’ve played. Rickety scaffolds, giant stone ruins or murky underground caves- a handful of times I just had to stop and marvel at the landscape or my achievement of reaching the top of a building or structure. However, it has some technical issues that, depending on your tolerance level or even previous opinion about team ICOs equally symptomatic titles, could be a minor annoyance or an infuriating deal breaker. Ever since 3D gaming became a staple, developers and players have been striving for games cameras to not only be functional, but enhance the experience. The Last Guardian, at its best, provides a genuine and exhilarating sense of verticality and tension. At its worst, it is an erratic and irritating struggle, especially noticeable where it really needed to excel- the interior or dark scenes. While some manual adjustment did help, I found myself staring at a rock face or black screen too often. Likewise, the navigation of the boy on Trico itself is reasonably hassle free- there’s no grip gauge from shadow, for example, responsiveness is most noticeable when the player needs to be urgent or accurate. More times than I care to admit the boy just went missing in Trico’s feathers, only to surface somewhere random. It unfortunately took the fluency and cohesion out of the movement of the two. Each area, whether it be a corridor (beautifully) lit by candle light or a more open, sun drenched courtyard or even shimmying along narrow ledges or leaping up a sequence of vertigo inducing pillars, TLG produced an equal dose of giddy anticipation and awkward apprehension. By no means the worst example of this, but one set piece I thought could have perfectly exemplified both the games beauty but highlights it’s problems is very early on. There are no bright yellow indicators like the Uncharted games (it would obviously be a severe detriment to the aesthetic) but hanging and shuffling along a giant chain embedded in a rock face while Trico jumps from column to column behind you is as precarious as any Nathan Drake has scaled, and should have been gorgeously framed and seamlessly witnessed. Unfortunately I was constantly wrestling with both controlling the character and camera to not only try to manually observe, but more to escape from clipping and extreme close ups of just nothing. There are some truly fantastic environmental puzzles along with consistently epic architecture and heart stopping moments of danger, tension and trust here, which should come as a welcome comfort to veterans of the creators work. Any mention of the story or ending would destroy the sheer joy of watching it unfold. While It’s technical downfalls have to be forgiven, but certainly not excused and as a timeless artistic masterpiece tortured by an obtuse camera and clunky controls, The Last Guardian is a product of it’s journey as well as a victim of time and expectation. As is so indicative of the current gaming industry, the demand for its release and the allowance of future improvements inevitably overpowered its chance at immediate classic status. While it has definitely been worth the wait, I sincerely hope that in the near future after a much needed patch, I will be playing a complete, uncompromised and majestic video game. Previous Post Resident evil retrospective- putting the fear into VR.